Joe Bonamassa is known world-wide for his blazing guitar fireworks, slick suits and vintage guitar collection. While Live At The Carnegie Hall – An Acoustic Evening contains all of those elements it is about something a little be out of the ordinary. Joe’s rising to sell out theaters has come largely without any terrestrial radio airtime; without a “hit”. This CD/DVD/Blu-ray packages really shires a bright spotlight on Joe’s songs. Featuring five tracks from his latest studio release, Blue of Desperation, the set does not rely on being any sort of greatest hits collection. Joe has the freedom to play what fits the presentation. His band includes Tina Guo (cellist and erhuist), Hossam Ramzy (percussion), Reese Wynans (piano), Anton Fig (Drums), Eric Bazilian (mandolin, hurdy-gurdy, saxophone, acoustic guitar, vocals), and three Australian backing vocalists, Mahalia Barnes, Juanita Tippins, and Gary Pinto. The songs take on a earthy tone that really allow you to focus on the melody and the song structure. Let me be clear that by no means is this missing the elements that draw guitarists to Joe’s playing. For those familiar with Joe’s previous, acoustic release, An Acoustic Evening at the Vienna Opera House, this performance gives a very different feel so there is no need to worry about it being redundant. 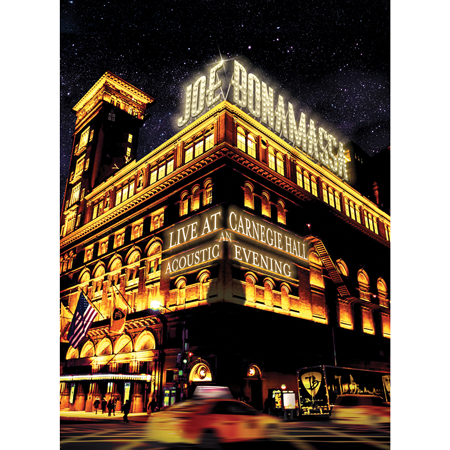 Live At The Carnegie Hall – An Acoustic Evening is available now.